Well the linky Galz over at Cardz TV are at it again. What you might ask? another challenge. How awesome is that? This one is such an great one to try to enter. I love toasted marshmallow. I was introduced to them by a neighbor who family always had a bon fire in their back yard. Wow! I can taste that toasted marshmallow now. Please join us this week and share in the fun and memories of having toasted marshmallows. I would definitely love to see what you create. So stop on over at CARDZ TV and enter your project and don't forget to stop by the other DT members to be inspired and see their wonderful creations. Super cute little campfire! I love it! Great toasty little card!! So cute!When Im craving a smore I just use my stove and toast the marshmallow there.I havent gone camping in such a long time I would really enjoy one at a real camp fire. This is such a cute card. I love the embossing. It brings back great memories for me of bonfires and great friends. Wonderful card!! 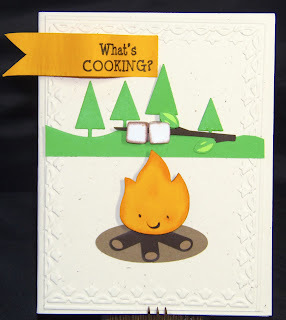 Adorable Card- Love the embossing and campfire. So cute, makes me want some right now! OMG, hello, my friend!!! Thank you so much for stopping by, it was wonderful to see you visit!!! I'll be back soon, my sweet friend! that is just a totally awesome card!